Providing evaluation, education, prevention, and treatment for injured workers or those individuals experiencing prolonged limitations. Our program includes specialized services for treatment and prevention of work injuries. A physical therapist will make an on-site visit to work with an individual(s) to evaluate their workstations. The therapist will make recommendations and educate each person on ways to help improve posture and specific work tasks. Includes a report with a summary of recommendations. A comprehensive 1 or 2-day standardized test performed by a specially trained physical therapist to objectively measure a persons maximum safe, functional abilities and their ability to perform work-related tasks. Tests record a broad range of physical capabilities including strength, flexibility, endurance, cardiovascular fitness, materials handling ability, coordination, static postures and repetitive movements. These results can be matched to a specific job description. A physical therapist works on-site with companies to provide various educational services from seminars on Back Care, Office Ergonomics, and Shoulder Care, to injury consultation, and on-site stretching programs. The FJA is a comprehensive, process of identifying and evaluating the physical demands of the work. Factors in developing an effective work injury prevention and management process involve analyzing the worker, the work, and the work site. Employee input is essential to this process and leads to credibility and validity of the Functional Job Description (FJD), written from the job information analyzed. Specially trained physical therapists work with employers to analyze jobs and write up detailed, functionally based, job descriptions. Accurate FJD’s are essential for a company to achieve ADA and EEOC compliance. A Pre-Work Screen tests the essential functions of a job based on the FJD. Employers can request job applicant’s take a PWS to determine safe physical and functional ability to perform specific tasks of the situation. To meet ADA/EEOC compliance the job applicant has received a “conditional offer” of employment from the employer before testing takes place. Functional testing may include activities such as lifting; force testing, push and pull, grip, postural tolerances, climbing, balance, and job simulation tasks. Physical therapists perform the Pre-Work Screens. A physical therapist works with individuals who have been injured to evaluate and treat their work-related injury. Therapists that have exposure and experience in various workplace settings are better equipped to address these types of patients, and offer a more structured progression of exercise and work simulated activities. Not sure if you would benefit from Industrial Rehabilitation Therapy treatment? 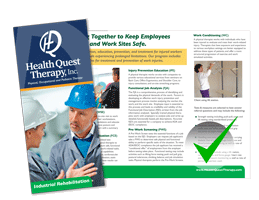 Find out more by downloading our Industrial Rehabilitation Therapy brochure, and learn how Rehabilitative Physical Therapy may be your best option to get you back to work as quickly and safely as possible. Treatment plans at Health Quest Therapy follow an evidence-based practice. Designed to include the necessary time, frequency, and intensity needed to achieve optimum results. We offer a variety of specialized treatment methods and state of the art equipment. Strength testing including, push-pull, carry and lift testing using standardized protocols. Dexterity testing with hand coordination tools, nuts and bolts, pegboards and grip and pinch strength measuring. 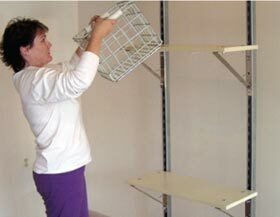 Handling test using a lift station, and carrying baskets. Use of a force gauge, heart rate and blood pressure monitoring, as well as rate of perceived exertion. Mobility testing, include using a lift station, carrying baskets, and force gauge, heart rate and blood pressure monitoring as well as rate of perceived exertion used.